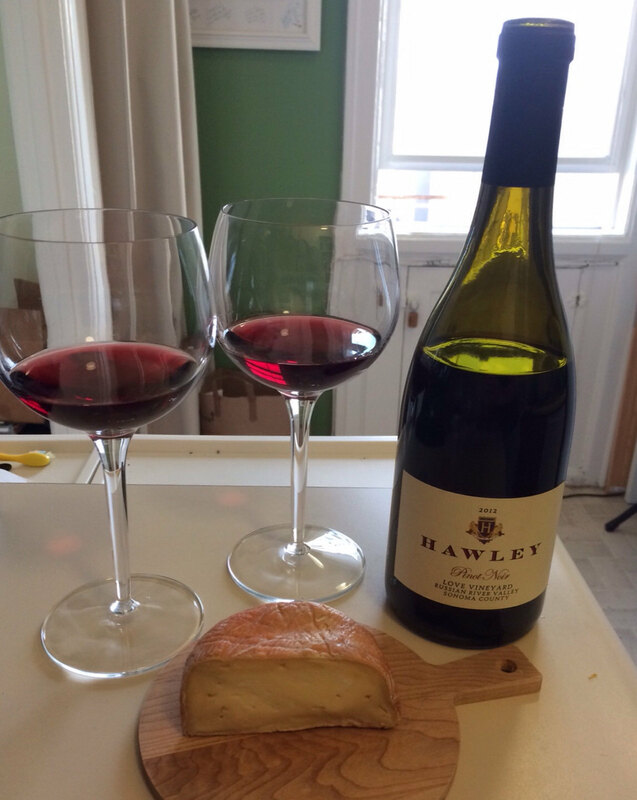 During our initial swirlling of the Pinot Noir, we both noticed a large assortment of aromas. I picked up a tartness that I determined to be sour cherry, as well as a hint of sweetness, earth/graphite and strawberries. Neil said it was generally fruity, cherry and had a tiny hint of alcohol. Once we tasted the wine, I identified a hint of funk, the flavor of graphite, spice in the throat and a smooth fruity finish. Yum! Neil found quite a few flavors as well: cherry, a pleasant light spice, and a hint of earth. He also described it as a semi-dry, yet fruity wine with a full, round flavor that fills the whole mouth. Definitely a winner by both of our reviews. The Red Hawk cheese had such an exciting story when we learned about it during the tour. Who wouldn’t want to enjoy a cheese discovered by accident! We knew this cheese had some funk but then it quickly reminded us as soon as we opened the package. I made note of the salt, funk and tangy aromas. Neil said the smell was delicious and that it reminded him of barnyard and straw funk! We both came up with new flavors from what we remembered from the initial tasting. Neil noticed a mustard flavor and I thought it was more like walnuts. How cool! We really enjoyed the smooth and creamy texture, pleasant funk and all the flavor. It even lingered nicely. Have we got you daydreaming about Red Hawk cheese? Click the link to the left to get it right from Cowgirl Creamery! When it came time to pair the Pinot Noir and Red Hawk, Neil found the spice in the wine to be magnified like crazy! He did like that the “wine reigned in the funk of the cheese!” He also noticed the flavor of the cheese to be softened. I preferred the wine and cheese separately because the pairing caused the wine to taste like a cough drop. The cheese didn’t change much for me, still salty and walnut. They were definitely good individually though! This sparked me to check the website, http://www.hawleywine.com, to see if there were any of this vintage still available. Unfortunately they are sold out, so I guess we’ll just have to savor that flavor as a memory and try out their new vineyard.